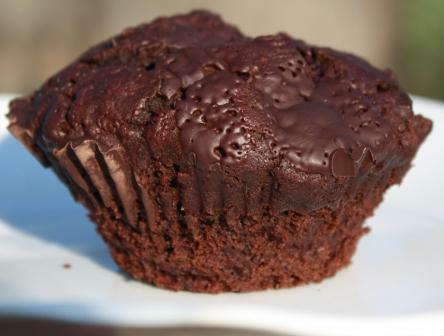 Easy gluten free muffin recipe with a rich chocolate flavour. This Gluten Free Muffin Recipe is easy to follow and makes deliciously rich gluten free chocolate muffins. We used 72% dark chocolate which we love and which gives a particularly rich flavour. If you prefer something smoother then milk chocolate is a great choice. Muffins are one of the easiest cake recipes to make since all you need to do is mix the wet ingredients into the dry, pop the mixture into cases and cook. If you want to offer a real gluten free treat to family and friends then why not make them for your gluten free breakfast. This gluten free muffin recipe freezes well. Freeze on the day of baking and defrost your muffins individually or in batches to enjoy as and when you like. These quantities will make 12 muffin. 3 to 5 oz (100g – 150g) dark chocolate cut into small chunks or chocolate chips. Chocolate chips will hold their shape better when cooking. 1. Pre heat oven 400 F, 200 C (180 C fan oven), gas mark 6. 2. Place the dry ingredients in a bowl. 3. Whisk the egg with a fork. 4. Pour all the wet ingredients into the dry and stir until just combined making sure no dry ingredients are visible. 5. Fill muffin cases to ¾ full. 6. Sprinkle top of each muffin with chocolate chunks or chips. 8. Transfer your gluten free chocolate muffins to a cooling tray and leave to cool. Adapt this gluten free muffin recipe by replacing the dark chocolate with milk or white chocolate. Add dried cranberries to your muffin mix before baking. Cranberry and chocolate is great combination.